A Few Words on Ubuntu. Ubuntu is a Linux operating system for personal computers, smartphones, tablets and network servers. It has gotten its name from the Southern African philosophy. It translates to “human-ness”, its developers suggest that it can be loosely translated as “humanity to others” or “I am what I am because of who we all are.” A deep philosophy behind a small operating system. Small though it may be – most probably it will never reach the number of clients that MS Windows or Mac OS have, it is still quite popular. Why? Well, our first guess would be that Ubuntu is completely free – its users are encouraged to use it, study it and improve upon it. Ubuntu comes with a wide assortment of open-source software, has incredibly low requirements (it is the best choice for older computers, on which Windows is working at snail’s pace) and flawless built-in security modules. If you are a little interested now, visit their website and learn more. Having said that, let us move to the topic of this article. More and more people choose Ubuntu as their primary system when it comes to working. However, as it is not as “important” as these two massive systems mentioned before, it is harder to find reliable tools to support us with our work and provide an effective time management. Nevertheless, we have done some research on the topic, trying to find best time tracking apps that would be helpful and now we proudly present to you the list of ten time tracking software for Ubuntu. No wonder that TimeCamp this is our first choice =] We are proud of our product and without any doubts, we put it on top of this list. Timecamp is suitable for both professional companies and agencies, where teams have numerous members and busy individuals. It boosts productivity and efficiency of any working person. 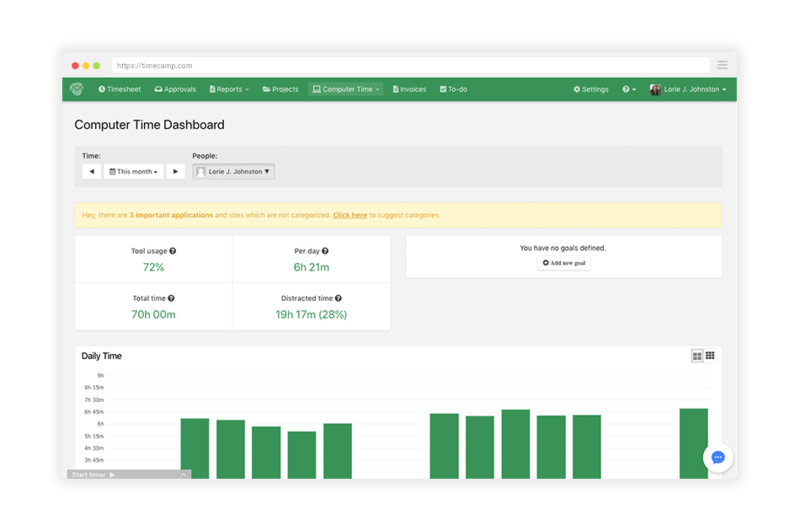 With TimeCamp you will be able to accurately bill your clients, measure project profitability, track and analyze time spent on the project and much more. Among its features are graphical timesheets integrated with calendar, history of your project portfolio, automatic invoicing based on hours, filters and reports. To tell the truth, it is hard to enumerate them all, better see for yourself! 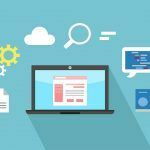 What is more, TimeCamp offers a whole bunch of integrations with other tools, which will enhance your working productivity even further! Sign up today to get an efficient time tracking software for Ubuntu for free! Click HERE and get most out of your work! 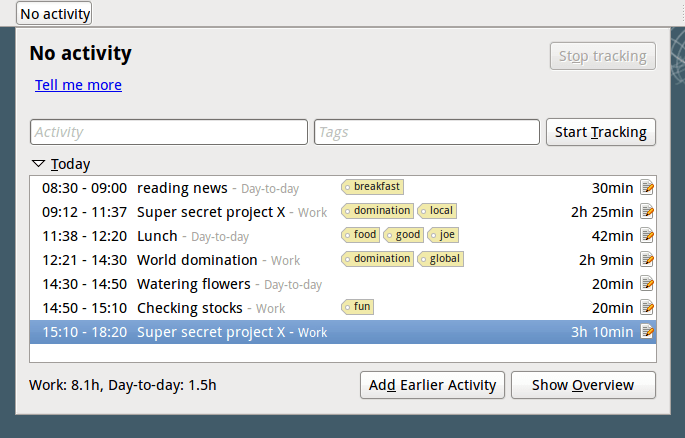 When it comes to time tracking, Hamster is one of the recommended tools for Ubuntu. After installation, it is added to your indicator menus, and once you hit a simple keyboard shortcut Super+H (super is an alternative name for the Windows key) and type what you are doing, you will be able to start/stop or change tasks. What is more, Hamster offers categorization of your tasks (you can add tags to them, and Hamster should do an auto-completion) and provides statistics which are HTML exportable so that you can send them to others. You can learn more about it here. 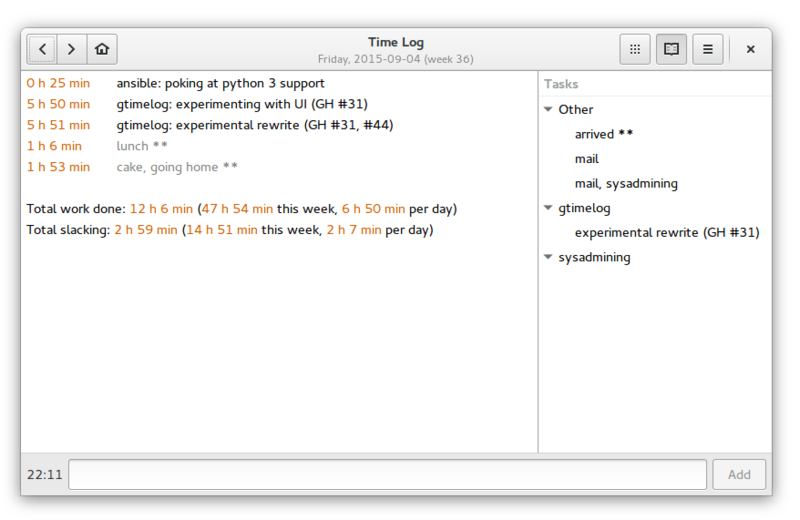 Toggl offers its Toggl Desktop for Linux application for time tracking. 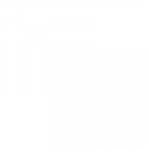 It synchronizes data with the web version of Toggl immediately, but it can also work offline, storing data locally and sending it to the server whenever there is a network connection. Tracking time is intuitive; it requires filling the details of your job and clicking the green “play” button – from that moment on the time is being tracked. We can edit the description of our tasks and add tags to them. Toggl even offers a reminder for those, who often forget to track their working time. Check the differences between Toggl and TimeCamp. GTimeLog is another app that keeps track of our time. It is a very basic one – the main purpose of its creators was to keep it as unitrusive as possible. However, the use of it is a bit more complicated than in the case of other time tracking apps. Instead of clicking certain buttons, we have to write commands to properly track our time and name tasks. It offers daily reports (but we have to choose to send them) and in stores time logs in case we forgot to track time. GTimeLog is a simple app but intended for more advanced Ubuntu users. Learn more about it here. 5. Org mode for Ubuntu. Another app designed strictly for the Linux environment is Org mode. It can be used as a to-do list manager and planner. We can turn tasks into headlines, clock in and out quickly and produce customizable reports. Org can be adapted to our workflow – it displays the scheduled task for the week, to-do lists and projects. A decent tool with various features but intended rather for software engineers and not for regular users. Anyway, if you are interested, check it out here. Klok is an adobe air application. It tracks our projects, providing a visual display of our work in a form of charts and graphs to manage our working time more efficiently. Every detail of our working time is monitored and analyzed. Also, the design of this tool is pleasant to the eye, and the use is intuitive. Unfortunately, its quality comes with a price; the full version of Klok costs 19.99$. Though the free version is available, it lacks some of the most important features. 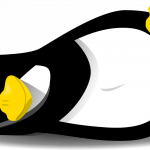 7. jTimeSched for Ubuntu – How to uninstall time tracking tool? jTimeSched enables its users to track elapsed time for tasks and projects. Its aim is to provide intuitive and only necessary functionality. In comparison to other apps designed strictly for Linux environment, jTimeSched is easy to operate – we can start and remove tasks with a few clicks, categorize them by colors, sort by categories, dates, progress or time spent on them. Its author calls it a “lean tool for time tracking,” confirming its simplicity. The main weakness of this software device is that it does not provide any statistics. Regardless, it is a free and solid time tracking app. You can find it here. To start with, Kimai is a simple, open source time tracker. It can be installed as a web service or as a single-user program. It tracks work time and provides statistics on demand, whether it is the period of time, type of project, certain customer or action. Even if we close the web browser the time is still being tracked until we stop it from any web browser. Available in 15 languages and open to customization (for example we can design our own skin). Kimai is constantly being developed, for more information visit their website. Time Doctor is one of the time tracking tools that offer their app for every operational system, including Ubuntu. It tracks the total time worked by every person that uses it and provides a breakdown on how much time is spent on certain projects, clients and tasks. Furthermore, a useful feature of Time Doctor is the gentle reminder to get back to work; whenever the app notices that we are getting distracted (for example spending too much time on facebook). It offers a 30-day free trial (even a limited free plan) and its pricing starts at 5$ for a single user and 9.99$ per user for a company, billed monthly. 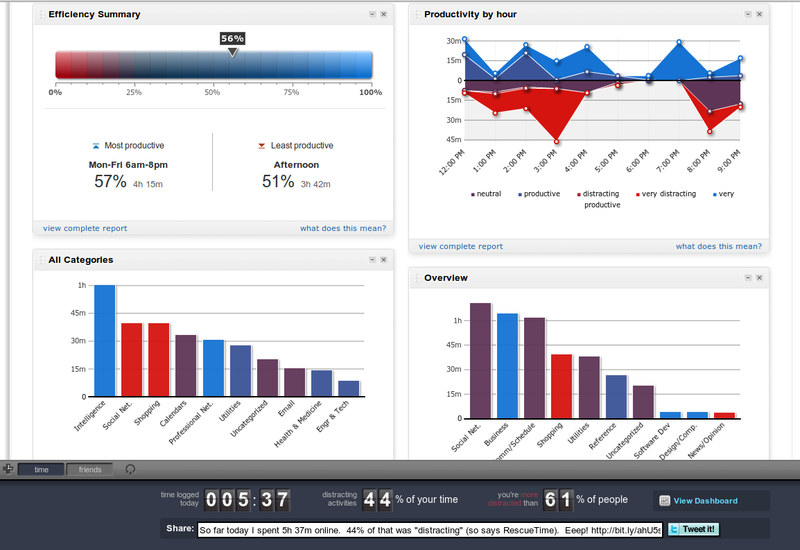 It took them a while but RescueTime app has been officially let for Ubuntu. Running in the background it tracks time spent on applications and websites, providing reports and statistics based on our activities. We can block distracting websites and even choose for how long we want RescueTime to do so. What is more, it also informs us when we are getting distracted. It comes with a free and premium version, if the free version turns out not to be sufficient enough, we can try the premium one on a 14-day free trial period. Working on Ubuntu? Start tracking your time with TimeCamp! Thousands of companies worldwide can tell you that you won’t regret it! A new opportunity on the horizon – Full TimeCamp and Zapier integration! I have gone through the post which is very important. There are many time tracking software which is very useful. 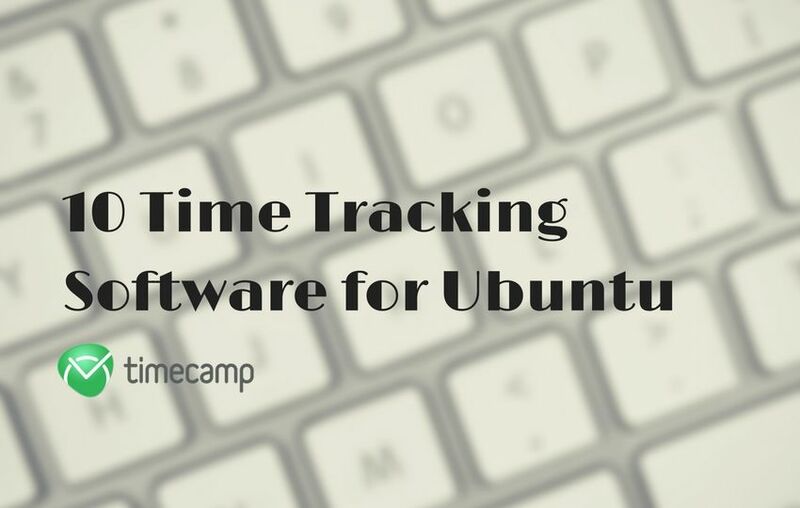 Among all the software TimeCamp is the best time tracking software in Ubuntu. Time doctor is also a very good software. In the beginning of this year I moved from Windows to Ubuntu, because I was in huge need for a change. One thing I missed was time tracking app, because the one I used didn’t work on Ubuntu. Last week I found your post and now I know that I ave plenty to choose from.